WE NOW HAVE A NEW PRIVATE CAR PARKING SPACE! A large living space has two sofas, TV, DVD, iPod dock, CD player and a gas 'wood' burning stove - cool in the summer and cosy warm in winter months. A large 6-seater dining room with limed, solid oak furniture is adjacent to an excellently equipped kitchen with range cooker and both lead onto a private terrace with garden tables and chairs. There is a lovely raised terrace as well which is perfect for idyllic morning sun (and a coffee) giving you in-town peace and tranquility. Through the gate, steps lead you to the lawn and unique, mature garden - a plant lovers paradise with a small lawn at the end. Upstairs the large master bedroom has a king size bed and ceiling beams (an extra person can be accommodated here) and antique furniture. The twin bedroom leads from a large landing - the bathroom, with a separate shower, has a roll top double end bath and fired earth tiles (with complimentary bubble bath). The furniture has been chosen to be as sustainable as possible - FSC wood or vintage. Delicious sheets and towels add to a luxurious stay. or just relax in our comfortable cottage drinking tea and eating gorgeous cake that can we can have waiting for you by request. and we have installed superheats broadband WIFI! Worth a trip: Shaftesbury boasts lots of independent shops from delis to cake shops to cafes. Try the chutneys at Turrnbulls or the morning croissants at Indulgence the Bakers. The Mitre pub in town has a back deck with views down the Blackmore Vale, a great early evening spot in the summer. There are many walks straight from town which can take you to the heart of the countryside and the Cambourne Chase. Let us know in advance and we can have tea and cakes ready for you on arrival. Or the local deli can provide a hamper of food for you (please contact us in advance for details). Our House / Young Kids? : The garden was created by a keen gardener and there is a top lawn which in spring and summer is bursting in colour and plants. The terrace which can be accessed by the back door or fence windows is a great place to relax or have a BBQ. A gate to the steps and the rest of the garden means toddlers can play without you worrying about them walking up the steps. There are games and books for children to use. The house is equipped with a high chair, cot, blender, microwave and other things that parents with babies and toddlers may need. the local area has hundreds of things for children to do from longleaf Safari Park to Old Castles - it would be difficult to get bored even in the rain. The bathroom has a roll top bath, a separate shower , a double width wash basin and a toilet within the bathroom. Tongue and groove panelling with fired earth tiles creates a traditional feel with contemporary fixtures and fittings. Practical, stylish and relaxing. There is a second and separate toilet. A small washing machine is located in a cupboard on the landing. There is also a laundrette with tumble driers just up the road. The large living room has two sofas and a wonderful gas fire. Its toasty warm in the winter and lovely and cool in the summer. The kitchen is fully equipped and has a range cooker and a coffee machine. It is a good kitchen for cooks. Aplant lovers dream cottage - mature garden with a lawn after a series of terraces to enjoy the peace and quiet. The garden is very private. Have a morning coffee out on one of the terraces. We stayed for a week over Christmas. Lovely cottage, decorated beautifully and very clean. Very thoughtful welcome gifts were an unexpected surprise!! Has all the amenities that you'd need and the parking space is very handy. The location in the centre of Shaftesbury is very convenient for shops, pubs and restaurants. Some lovely walks nearby, recommend Fontmell Down. Four stars instead of five only because of the single glazing that makes traffic noise and people very loud sometimes. Neighbor with dogs was also somewhat disruptive, but overall these minor distrubances did not detract from a wonderful stay, thanks! 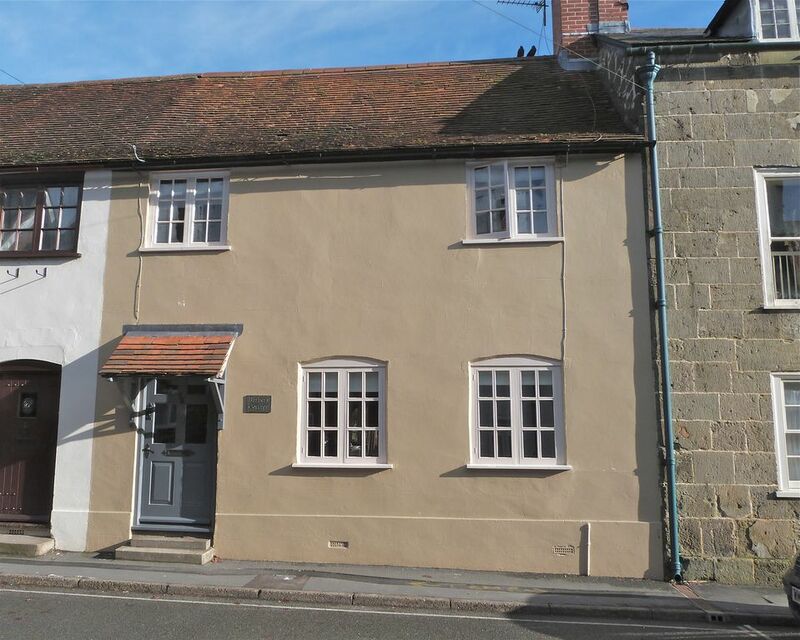 Lovely cottage which is very close to the town centre, with the added bonus of a parking space. We had a lovely few days with amazing weather and would heartily recommend Shaftesbury as a base from which to explore the area. One comment - would suggest that the kitchen lighting be improved as it was a little dull for cooking in the evening. Thanks for the tip - we will look into getting some more lighting in there. Spotless, pretty, comfortable, cosy and ideal for us. Stayed there with familly for 3 nights. The place is very clean. Beds are comfy and the kitchen very well equipped. Sally, the owner, was allways helpful when we had any questions. The house is located in very centre of shaftesbury so you can walk around easily. It has a parking place just at the back of the property, just 1 minute walk. After a day out you can relax in the garden! Strongly recommended, will be back. Had a great relaxed time. Lovely to find somewhere close to the town and that had a lovely garden to relax in. The cottage has everything you need is generously sized with a lovely garden to enjoy. The bedrooms are very comfortable and it was nice and cool in the warm weather. The parking space behind the cottage is also an added bonus. There is plenty to do and see nearby and the shops are very handy. Would highly recommend. Lots going on in Shaftesbury area this summer and autumn. Barbers Cottage is in the heart of the old Saxon town of Shaftesbury with its shops, cafes and restaurants all within walking distance. THE TOWN has wonderful views over the surrounding countryside - designated an area of outstanding natural beauty - great for walking / flying kites. We offer weekend breaks and mid-week offers in off peak season - Shaftesbury is only 2 hours by train from London and less than an hour by car from Bristol and a wonderful place to spend a weekend eating, shopping or relaxing.